Well, we’ve been in preschool for approximately .2 seconds, and the cub has already had two colds. On the plus side, it’s given me the opportunity to make, remake, and absolutely perfect this Homemade Chicken Noodle Soup recipe. 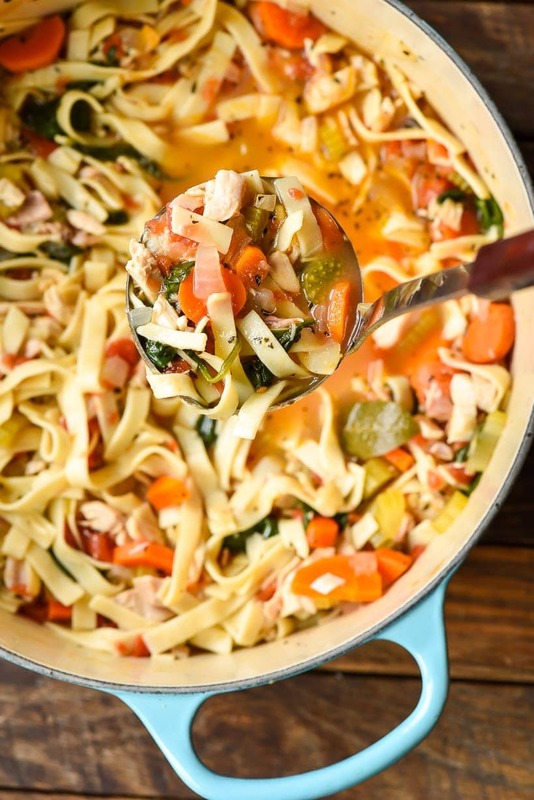 This is now our family’s gold standard chicken noodle soup, and I’m sure it will be a staple all winter long. I normally don’t follow recipes when I make chicken noodle soup. I’m more of a throw-in-whatever-veggies-are-lying-around-and-wing-it-with-the-seasonings kind of girl. 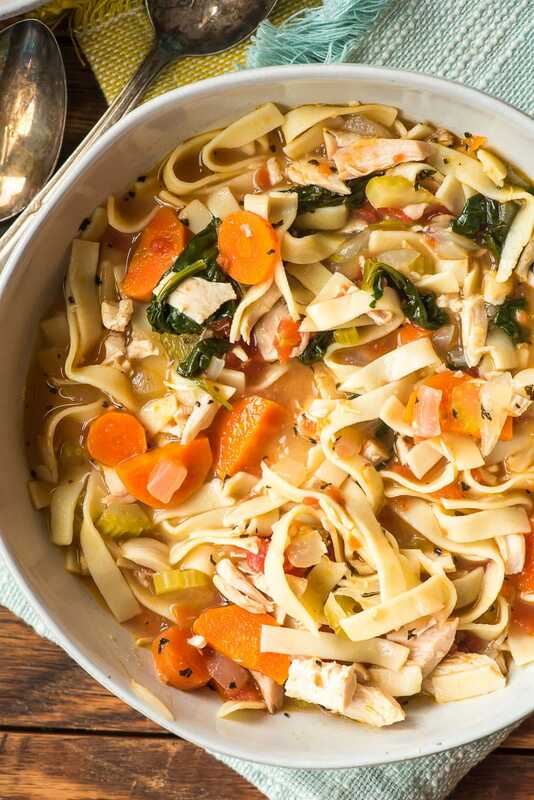 But on one occasion last winter, I pulled together a version of chicken noodle soup with canned tomatoes, egg noodles, wilted spinach, and a mix of dried basil and bay leaf that made me reconsider my anti-recipe stance. The hubby loved this particular creation and immediately declared it “THE soup.” Bolstered by his enthusiasm, I quickly tried to jot down the exact ingredients I used for this particular soup so I could file it away for the future. 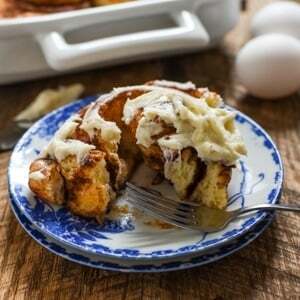 I made the recipe a few more times last winter, but then forgot about it until that fateful day in early September when our little guy was taken down by the first tornado of preschool germs. I pulled the recipe back out and assembled it one afternoon during nap time. The whole thing comes together in about 30 minutes, and it makes your house smell amazing. The little guy woke up as I was finishing up the pictures, and he wasted no time grabbing noodles right out of the bowl and slurping them up. The hubby arrived shortly after and was equally anxious to dive in. We quickly set the table and ladled out steaming bowls for all of us. A few bites in, the Mr. exclaimed, “Oh yeah. This is the soup.” That, my friends, is music to my ears. 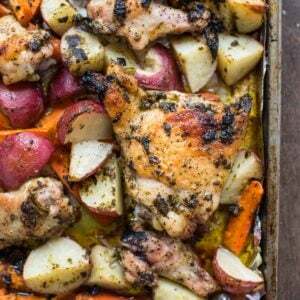 This recipe starts with a triple whammy of carrots, onions, and celery sautéed in olive oil. This is a classic combo that will have your house smelling amazing in minutes. From there, add a nice mound of minced garlic, sautéed until fragrant, followed by chopped chicken. I love to use leftover rotisserie chicken for noodle soup. We eat the chicken the first night for dinner (usually with these Creamy Mashed Potatoes), then I use the leftovers to make chicken noodle soup the following day. Next up, canned tomatoes. Are they really necessary, you might ask? Well, no, but they are what initially set this recipe apart from others I’ve made in the past. They don’t make the broth tomato-y at all. They just add a nice hit of sweetness and acidity. Follow up the canned tomatoes with some good quality chicken broth. I always prefer low sodium so I can control the salt. I haven’t given exact measurements for the broth, because this is really personal preference. If you like a thicker soup that’s mostly noodles, stick to around 6 cups. If you like a thinner, brothier soup, go for 8. Pop a bay leaf and a sprinkling of dried basil into the soup mixture, then bring the whole thing to a boil before adding your egg noodles. I’ll be honest, most of the time I use store bought, medium cut egg noodles. But if I happen to feel really fancy (or if I have the extra time), I’ll treat myself with a batch of homemade egg noodles. After the egg noodles are cooked, I stir in a couple handfuls of greens. Whatever you have on hand should work fine, but I usually use spinach. It’s another way to add nutritional value to the soup, especially if you’re making it for a house full of sickies. The whole process takes about 30 minutes from the first sizzle of olive oil to the first ladle of hot, steamy chicken noodle soup. Can I make chicken noodle soup ahead of time? 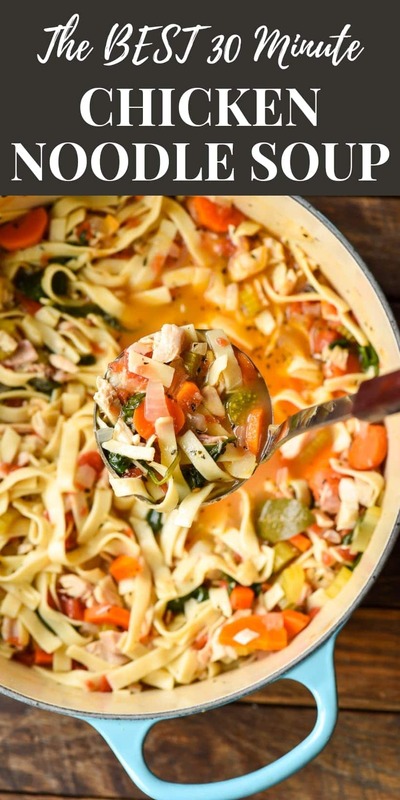 Can I freeze homemade chicken noodle soup? 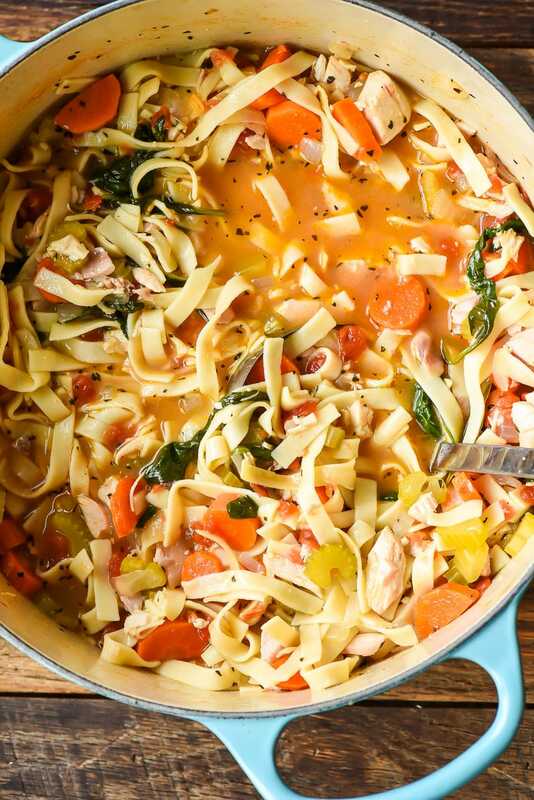 Here’s the bad news about chicken noodle soup: it’s not the best make-ahead soup around. The reason for this is the noodles. The longer the soup sets, the more liquid the noodles soak up, which can leave you with a pile of soggy, floppy noodles in a mostly dry broth. However, there is good news too! I work around this by preparing the soup completely in advance, but leaving out the noodles. The broth and veggies can all be made ahead of time and frozen until you need it. Then, simply bring the mixture (from frozen or thawed) to a boil in a large sauce pan, and cook your noodles in the broth when you’re ready to eat. 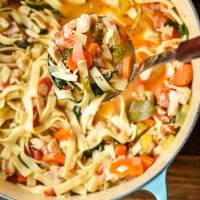 It still saves a bundle of time, but also gives you the taste and texture of a fresh batch of homemade chicken noodle soup. It’s the best of both worlds! 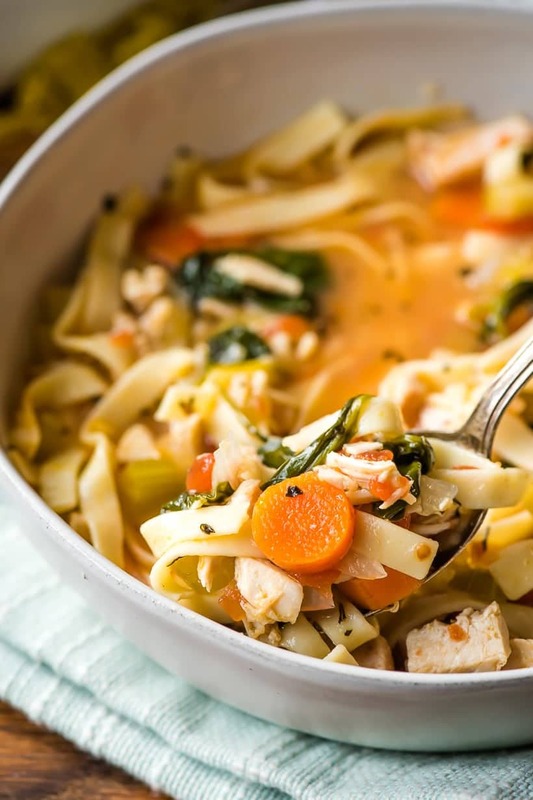 This comforting and easy homemade chicken noodle soup comes together in about 30 minutes and makes for a warm, filling dinner. Heat the olive oil in a large, heavy bottomed pot over medium heat. Add the onion, carrots, and celery and saute until starting to soften, about 5 minutes. Stir in the garlic and saute until fragrant, about 1 minute. Add the chicken, tomatoes, broth, bay leaves, and basil. Bring the mixture to a boil. Stir in the egg noodles, return to a boil, and cook according to package directions, or until the pasta is tender. Stir in the greens and continue to cook for 2-3 minutes or until the greens are wilted. Remove the bay leaf, taste, and season with salt and pepper as needed. I prefer straight, medium cut egg noodles for this recipe, but feel free to substitute with curly egg noodles if you prefer. To freeze, stop cooking the soup after step 2. Remove the bay leaf. Allow to cool completely then freeze. When ready to eat, place the soup (still frozen or thawed) in a large heavy bottomed pot and heat, bringing back to a boil. Add your egg noodles and follow the remaining directions. Made a pot of this yesterday. Wonderful for a warm-up on a cool Fall day! I used rotisserie chicken and subbed in 1 TBS fresh basil from my garden instead of the dried. Also subbed in about 3 TBS of fresh chopped parsley because I didn’t have any spinach or kale on hand. I agree with you that the tomatoes were a surprisingly nice addition. One recommendation is to remove the bay leaves BEFORE you add the greens. It makes it a whole lot easier to find the bay leaves. 🙂 The soup didn’t require any salt or pepper at all despite using low sodium broth as you said. I thought it was perfect as is. I used all 8 cups of the broth and the noodles soaked up most of the broth by this morning but that’s OK. It’s like a chicken noodle stew for lunch today. (Yum!) Thanks so much for the wonderful recipe. It’s definitely a “keeper”. You were right about the canned tomatoes. It really does set this soup apart from the others I’ve made without tomatoes. I love chicken noodle soup, my favorite! It’s so simple and yet so delicious.